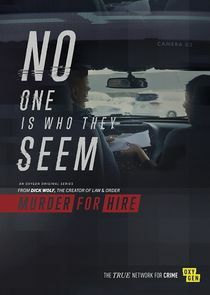 Murder for Hire gives an exclusive look into the dark world of contract killings, showcasing some of the most fascinating murder for hire cases ever caught on tape. In an alarming trend, investigators are seeing a sharp increase in hired hits across the country, and those attempting shockingly include: housewives, wealthy bankers, military officers and even grandmothers. From scorned lovers to jealous relatives, the show explores in rare, never-before-seen footage, how a seemingly good relationship can go wrong and the emotions surrounding the reveal when an intended victim discovers a hit has been taken on their life. Each standalone episode will feature a different case of undercover agents immersing the viewer into the real life sting and investigation as they attempt to catch the perpetrator and ultimately prevent a murder. After 40 years, a woman is excited to finally reunite with her estranged sister but is shocked when she finds herself thrusted into a sinister murder plot.